Creating efficient storage is a lot more than measuring the dimensions of your available space. Different industries require different equipment to function, so shelving must be able to accommodate small parts, expensive machinery, the latest technology, non-durable goods, etc. A versatile shelving system like wire shelving can fulfill a lot of storage needs, but it is just as important to get the right fit for your business. Make the most of your space and create efficient storage that works harder for you with specialty wire shelving that is specifically designed to satisfy your needs. Whether you work in an air conditioned packaging facility or an assembly plant, we have a specific style of wire shelving that will help you get organized. Do your storage needs require heavy duty weight capacities that can withstand a corrosive environment (including refrigerated space, a damp environment, or even outdoors). If so, you’re in the market for Stainless Steel Wire Shelving. Looking for something comparable that is a better fit for your budget? 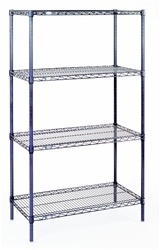 We carry a variety of rust resistant/rust proof wire shelving. Take, for example, our Nexelon coated wire shelving. Covered with a blue anti-microbial finish, this adjustable shelving unit is ideal for restaurants and NSF approved for use in food service. Perhaps your business is less industrial and needs something a bit more attractive. We also offer epoxy coated shelving units that come with either a black or a white finish. The special coating helps protect them from damage while the classic colors match the rest of your retail sales floor. 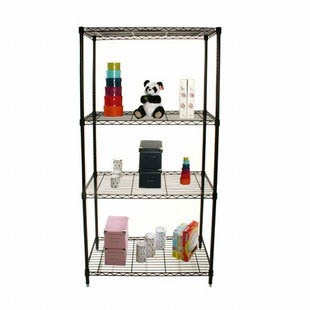 Merchandize your inventory with one of these Black or White Epoxy coated Wire Shelving Units. We understand that small businesses are often operated out of the home, which is why we also include our Home Series Shelving. With a more residential function, these kitchen carts, bakers racks, and wardrobe units are meant to help keep you organized. Prepare meals, entertain and serve guests, or simply save space to create more room for your home office. 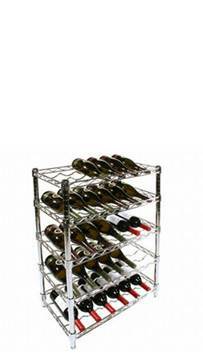 Personal and professional can find an equal balance in your home, especially with the help of a wire shelving wine rack (or two). 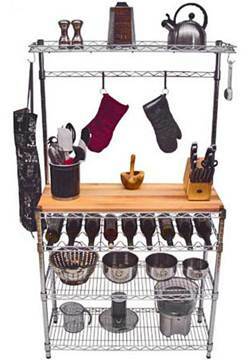 Do your space a favor and get the specialty wire shelving you need to get organized. Shop now and receive 15% off your Specialty Wire Shelving purchase using code “SPEC15” at checkout. Offer valid until March 17, 2013. 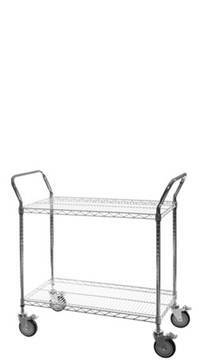 Discount only applies to items in the Specialty Wire Shelving category.